One thing you probably don’t remember is that time E.T. got shithoused. More than likely you remember the Reese’s Pieces. Everybody does. But what about the Banquet? The copious amounts of Banquet? It’s okay. I didn’t either until a month or so ago. I was on eBay looking for Banquet memorabilia, as I’m wont to do, when I came across an old poster. There, grinning back at me with his pug-like face, was E.T. He was clad in a white apron, one finger upward and alit, his other hand wiping down a bar top. He was standing next to a Coors tap. It’s such an odd cross-promotion—a character beloved by children and a beverage adored by adults. What I wouldn’t give to have been a fly on the wall during the conference call that spawned this thing. It’s so odd, in fact, that I had to understand why it existed at all. Sure enough, there’s a scene that starts just after the 43-minute mark and it 100% justifies the need for the poster. Elliott’s at school, about to dissect some frogs. E.T. is at home hanging out with Harvey the dog. But E.T.’s hungry, so he raids the fridge. First, he pulls out some potato salad and sticks his tongue right in the tub. But it’s not his vibe, so he tosses it to Harvey who just looks confused. Then, E.T. uses his weird sausage-link-looking finger to caress one of the cans of Coors Banquet on the bottom shelf. He grabs the can, cracks it open, and just as he puts it to his nonexistent lips, Harvey lets out a warning bark, as if to say, “Heads-up, dude, this isn’t going to end well.” But E.T. pays him no mind and absolutely slams the beer. A few small trickles spill out—because he has no lips—and flow down his elongated neck. Quick cut to Elliott, back in the classroom. He burps. Quick cut back to E.T., who, at this point is inebriated. Poor little dude is such a lightweight. As he stumbles away from the fridge he promptly walks directly into the kitchen cabinet. Elliott starts to look drunk. E.T. walks face-first into another cabinet. Elliott slumps further in his chair. E.T. takes a nosedive onto the tile floor. Elliott slips underneath his desk. Then, THEN, the party really gets going. E.T. has rallied quickly. He’s up off the floor and already popping the top on another Banquet. He chugs this one even faster than the first and crushes the can when he’s finished. 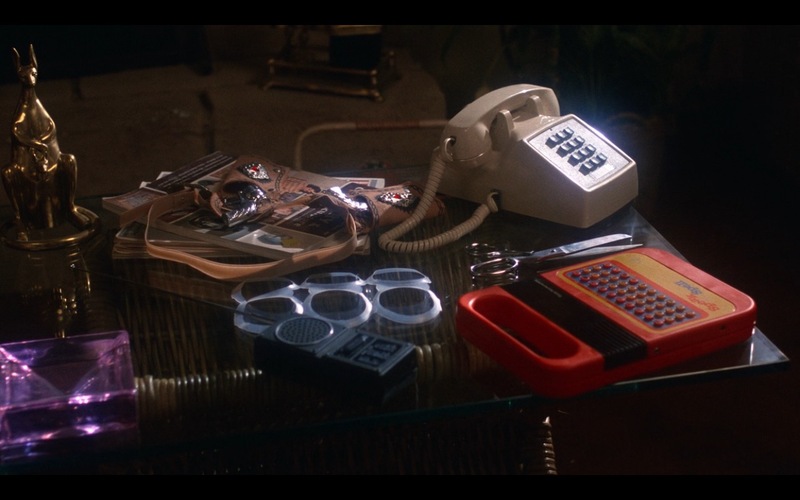 He’s on the couch now, with the Speak & Spell, trying to spell the word “nuisance.” He punches in T-S-W-V-Q-A-F-P, which, even for an alien, is pretty piss-poor. Dude’s wasted. So he starts channel surfing as he works his way through the rest of the beer in the fridge. It’s impossible to know exactly how many Banquets E.T. consumed. The number is at least eight, as that’s how many cans were visible in the fridge. But it seems like there’s more than a dozen empties kicking around the floor between the kitchen and the living room. At any rate, E.T. is out of his gourd. 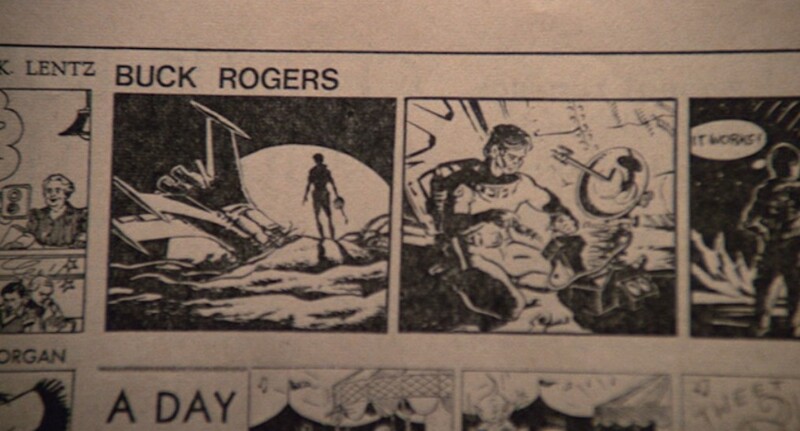 Then, in a moment of clarity, his drunken little alien brain pieces together a frame from a Buck Rogers comic strip, a Bell Telephone commercial playing on the TV, and the Speak & Spell (sitting conspicuously next to an empty six-pack carrier) to hatch the idea of “phoning home” to his extraterrestrial brethren. This is arguably one of the most important scenes in the entire movie because a) it helps to establish the psycho-emotive connection between E.T. and Elliott, and b) it develops the “phone home” concept which becomes one of the most famous lines in cinematic history and serves as the impetus for the entire third act. Phew. 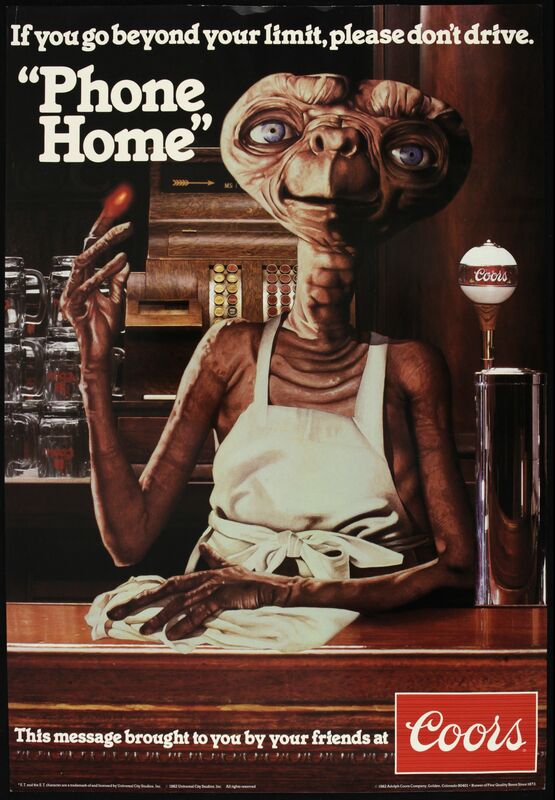 What I’m trying to say is that, even though the poster was necessary to help combat the assured uproar surrounding the portrayal of underage drinking, Coors Banquet is actually the reason E.T. makes it home safe. And the reason the movie has a happy ending. Thank you, Banquet.